The Planetshakers band is an Australian rock and worship band, a part of Planetshakers's ministry. Their music is a contemporary style of praise and worship tempered with mainstream rock and pop. 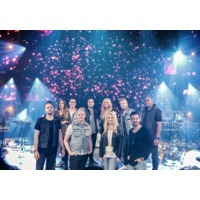 The Planetshakers band is the central part of their events. The 2003 Australian Idol winner Guy Sebastian was also a part of the Planetshakers band for several years, taking both lead and backup vocal parts on the 2002 and 2003 albums and conferences. Many of the musicians originated from Youth Alive South Australia, which also released CDs. Some of the songs written by current band members for the Youth Alive albums, such as 'Phenomena' and 'God of Miracles' (from Youth Alive Western Australia) have also featured on Planetshakers earlier albums. In 2004, their CD Open Up The Gates was nominated for Praise and Worship Album of the Year for the Dove Awards. Planetshakers announced at their 2008 conference that they would begin to release tracks via subscription to the "Planetshakers Revolution" - an online music/resource distribution system designed to consolidate and build upon different products that they had previously offered. "Revolution" was then discontinued on June 2010, with Planetshakers informing users they planned to move to other mediums to distribute their resources.